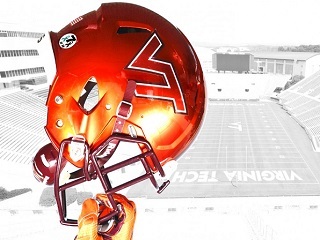 Alison Parker's favorite color will be on full display at Lane Stadium this Labor Day. Regardless of the final score, this weekend’s Labor Day college football home opener pitting the Virginia Tech Hokies against Ohio State is going to be memorable. Each team member will be sporting a special sticker on their helmet honoring the memory of slain WDBJ-7 reporters Alison Parker and Adam Ward. The players will wear a helmet sticker that features the No. 7 and teal and maroon ribbons, along with the initials of both victims. The sticker follows various other remembrances on campus. A moment of silence was observed at this past weekend’s volleyball and soccer matches; similar teal and maroon ribbons were also handed out to students and visitors attending Aug. 30-31 athletic events.